Klein 614-2 1/16 in. 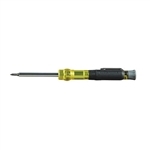 Slotted Electronics Screwdriver 2 in. Klein 614-3 3/32 in. Slotted Electronics Screwdriver 3 in. Klein 614-4 1/8 in. 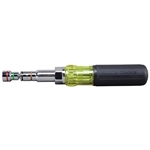 Cabinet Electronics Screwdriver, 4 in. Klein 614-6 1/8 in. Cabinet Electronics Screwdriver, 6 in. Klein 635-5/16 5/16 in. Heavy Duty Nut Driver 5/16 in. Offering a variety of tip types, hex sizes, shaft lengths, and handle designs, Klein has the screwdrivers and nut drivers professionals demand to get the job done with comfort and ease of use.